Browse: Home » Whatever Happened to the East End Subway Extension? Unequivocal he may have been, yet last time I checked, and with less than a year to go before the 2014 GAMES (I’m counting down the days already), the East End is still looking remarkably Subway free. 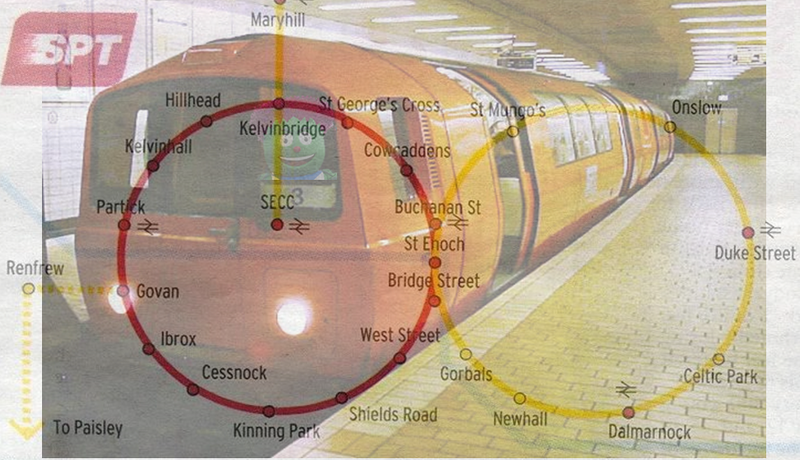 Less of a ‘done deal’, the east end underground loop would instead seem to be just one of many entries on Glasgow Labour’s fantasy wishlist of infrastructure projects that have, in reality, never existed beyond their own imaginations, half-baked ideas scribbled in their election manifesto (a city-wide free WiFi network anyone?) and then the inevitable AMAZING NEW THING PROMISED BY COUNCIL splash in the local papers. 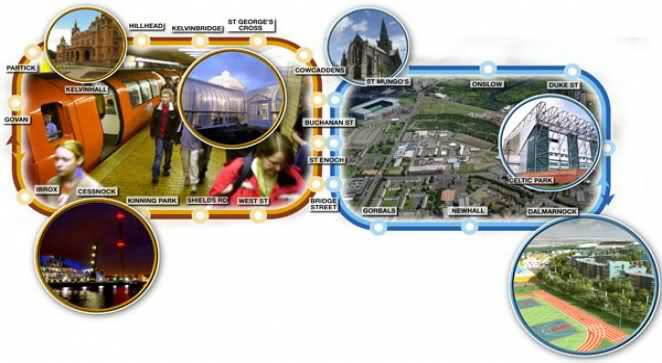 Glasgow’s Commonwealth bid – that is the actual document which formed the basis for the city winning the games – included the line that the city has a “transport network fit for the 21st century, that will make the Games run smoothly and efficiently”, an incredible revelation to anyone who traverses the city by public transport each day. In fact, we’re told that Glasgow’s public transport network is so all encompassing that there will be “no need” for anyone to even have to take their car to get to any of the Commonwealth venues! So while the below image, complete with its “Desire” tagline, might look like the acid-fuelled imaginings of an undergrad vis com student, it’s actually a concrete (in more ways than one) plan for the city drawn up by engineers in 1965. In their enlightened zeal they’ve even managed to work in plans to take the inner ring road straight through Glasgow Green, while Maryhill Road and Great Western Roads would, to give two examples, both become expressways. While their full proposals never quite came to fruition, hundreds of millions have been still spent in the last decade making Glasgow more car-friendly. In the case of the the M74 extension, this was in the face of vehement local opposition and even an official inquiry ruling that the project should be scrapped, given the vast economic, environmental and social damage it would cause for the communities around it. The report’s findings were a far cry from the city planners in 1965 and their vision of a “White Heat” utopia yet the powers that be were willing to maintain this delusion and powered ahead with bulldozing through communities/parks/toxic wasteland, just as they had in every decade previously. Much of the recent road construction has been about linking up different parts of this bygone project, with the intention of shaving minutes off journey times and creating a more efficient road network for those wanting to fly through the city without stopping. Co-ordination, efficiency and (realised) expansion: words that definitely aren’t associated with Glasgow’s shambles of a public transport network. By all means, we’ve got lots of trains, with an extensive suburban railway network, millions of buses and the subway covering part of the city. But where they link up it’s the exception rather than the norm, and the idea of being able to get a ticket that you can use on say, both a First Bus and then train run by er, First Scotrail is seemingly too much to ask for. But could there be hope in sight? The artist’s impression and the finished article: Dalmarnock’s £11m Glass Box. Glasgow has a particularly low car ownership rate of less than 50%. In the East End, barely a third of people own a vehicle. Yet huge efforts have been put into shaving minutes off journey times in and out of the city while those living beneath or beside these concrete behemoths have hardly been factored in at all. Meanwhile, the mooted “East End subway link” rapidly became a £288m programme for changing the signs at each existing station (and in some cases thenputting the old ones back again) and eventually, so we’re told, implementing “driverless trains”. Still noticeably sans-subway, The East End received a massive boost in the form of Dalmarnock station closing for a year for the sake of planting a giant glass box over it, coming in at a mere £11m. Fittingly for a giant glass box, the reasons for sticking it there are pretty transparent too – much less to do with serving the needs of the local community and far more about giving a veneer of ‘regeneration’ ahead of the Commonwealth Games and the thousands of tourists that will fleetingly arrive in the area. Saying all this, if an East End subway extension does suddenly burst through the ground at some point in the next twelve months, much more than just going back on my words, I personally vow to lead the campaign for a statue of great city visionary Alistair Watson to be built towering over Duke Street, engraved – Dewar-style – with the immortal words”THERE WILL BE AN EAST END SUBWAY EXTENSION (By 2014. Unequivocally.)”. Of course, I say this safe in the knowledge it never will as everyone knows Councillor Watson and his pals were far too busy going on all-expenses paid “fact-finding” junkets to Rangers cup finals for them to oversee anything approaching a mass expansion of public transport infrastructure. As the city’s current marketing slogan goes ‘People Make Glasgow’. People, notably those who sit in the City Chambers, also make priorities and it’s self-evident that expanding and improving the integration of the city’s public transport hasn’t been one. The Commonwealth Games organisers remain so confident that there’ll be “no need” for anyone to travel by car to the games that they’re already issuing warnings about “traffic chaos” and setting aside special road lanes for the Commonwealth elite to speed across the city. People may Make Glasgow, but GCC just takes all of us for a ride*. ← Whose City? Are the Commonwealth Games Ruining Glasgow?